Das Research Centre Sanssouci für Wissen und Gesellschaft (RECS) hat vor kurzem den folgenden Artikel über die friderizianischen Wandbranchen und deren Erforschung, Begrifflichkeit, Material, Bedeutung und Hersteller publiziert. Diese Art der Wandleuchter ist in den Schlössern Friedrich II zu finden. Ulrike Milde, Käthe Klappenbach, Über friderizianische Wandbranchen, in: Texte des RECS #3, 14/11/2016, https://recs.hypotheses.org/811. A brief summary in English of the article written by Ulrike Milde and Käthe Klappenbach and published in German follows, people interested in reading the entire article are advised to use a website such as “Google Translate” if they wish to translate the complete text. The article describes the effect, meaning, materials, manufacturers and results of research in to the enormously varied wall lamps (branches) to be found in the palaces of Friedrich II. The quality of the wall lamps in the palaces are very high and were to be found in virtually every room of the palace – the more important the room, the more pairs of lamps are to be found. During the day they served as decoration, at night were functional and beautiful when the candles were lit. 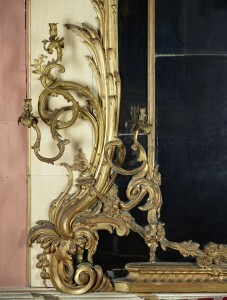 From the middle of the 18th C. these wall arms gained enormously in importance. Inspired by the example of France, Frederick and other nobility supported manufacturers in Germany in order to not to be dependent on the French manufacturers. They did not merely copy the French models but developed their own style, which became known as “Fridrizianisch” style. Despite the number of these wall arms (500 still exist from an original approx. 700) there has been little documentation or research made on these wonderful examples of the applied arts. An inventory in 2013 revealed how important the wall lamps were in the design of the entire room concept as most were individually created for the room in which they are found. The biggest problem for research is the fact that the techniques used to create these pieces changed very little over the years and therefore there are few clues to assist the researcher in dating the arms. Furthermore the authors discuss the reasons for the difficulty in identifying pieces with any degree of certainty that come up for sale on the open market claiming provenance. vielen Dank für die Übersetzung und Veröffentlichung des Beitrags! Wir freuen uns sehr, dass Ihnen der Artikel so gut gefallen hat.